How are Schengen Border Checks Legal? Although the Schengen rules require members to get rid of all the customs and ID checks on their borders, a country can declare a short-term exception under special circumstances. These "temporary reintroductions of border control" are tightly regulated by the EU government, which holds them to specific time limits, after which the countries have to remove the border checks again. The EU limits each country's border controls to 30 days, which can renewed up to six months (for fast-tracked emergency declarations, the limit is 10 days and renewal up to two months). Why do Schengen Countries Reintroduce Border Controls? In the past these temporary border controls were used to strengthen security for major sports events and political meetings, or in extreme cases like the 2015 Paris terrorist attacks. But everything has changed over the past year, with a historical surge in refugees coming to Europe from Syria, Afghanistan, and other places. More and more Schengen countries have been using temporary border controls to limit the number of refugees they will host or allow to pass through. Which Schengen Countries have Reintroduced Border Controls? At the beginning of March 2016, there were seven Schengen countries with temporary border controls: Denmark, Norway, Sweden, Austria, Germany, France, and Belgium (for Belgium, the controls are only along part of its border with France). Denmark used an emergency declaration starting January 4, so it's scheduled to reach its two-month limit tomorrow, March 4. After tomorrow, Denmark will presumably stop checking ID for new arrivals, though visitors leaving Denmark for neighboring Germany, Sweden, and Norway will still face checks when entering those countries. Like the rest of the countries that currently have border controls, those three national governments used regular declarations, and still have several months left before they reach the six-month limit. Besides the current cases, Hungary and Slovenia also reintroduced border controls in connection to the refugee crisis in 2015, but only for short periods. Their border control programs have been ended again since then. On March 4, 2016, a new EU plan was revealed to remove all internal Schengen border controls by November 2016 - but only if Greece improves security on its external borders (where refugees and other migrants first arrive in Europe, often by sea to Greek islands). If Greece doesn't do what the other EU members want by May 12, the EU could change the rules and allow Schengen countries to extend their border controls up to two years instead of just six months. They might even set up a coordinated system of border controls, rather than leaving countries to each declare new controls on their own. If the EU countries can't agree on a better way to handle the the refugee crisis even after two years, it's hard to say whether the Schengen Area's free-travel principles have any future at all. 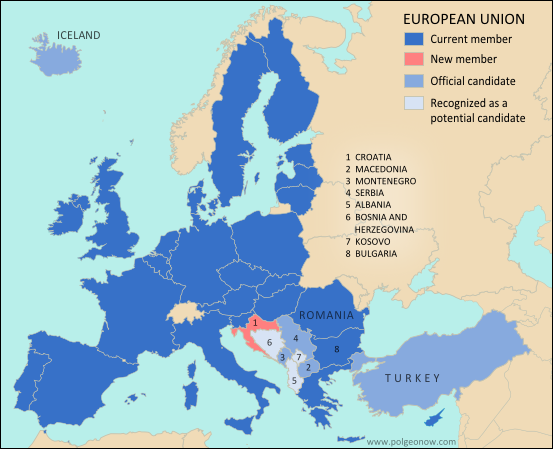 What's the Difference Between the Schengen Area and the European Union? 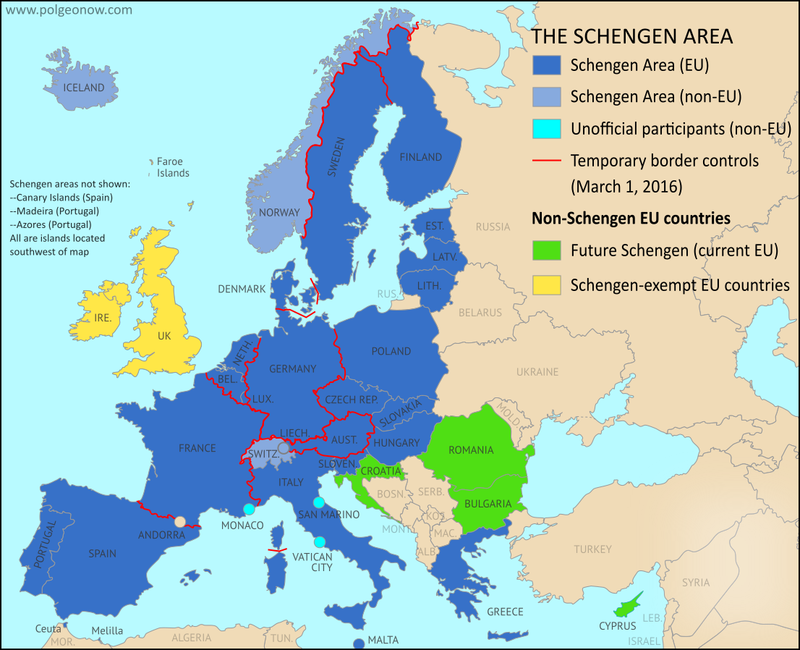 Which Countries Are in the Schengen Area, and Which EU Countries Aren't?